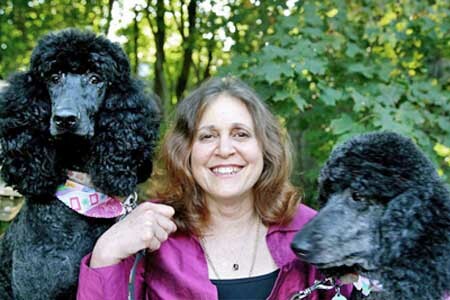 Veterinarian Margo Roman vaccinated her own Standard Poodle Wailea with the legally-required rabies vaccine. One month later, Wailea had developed autoimmune liver disease and muscle wasting in her head. Biopsies and extensive lab work costing over $6,000 showed a vaccine reaction. 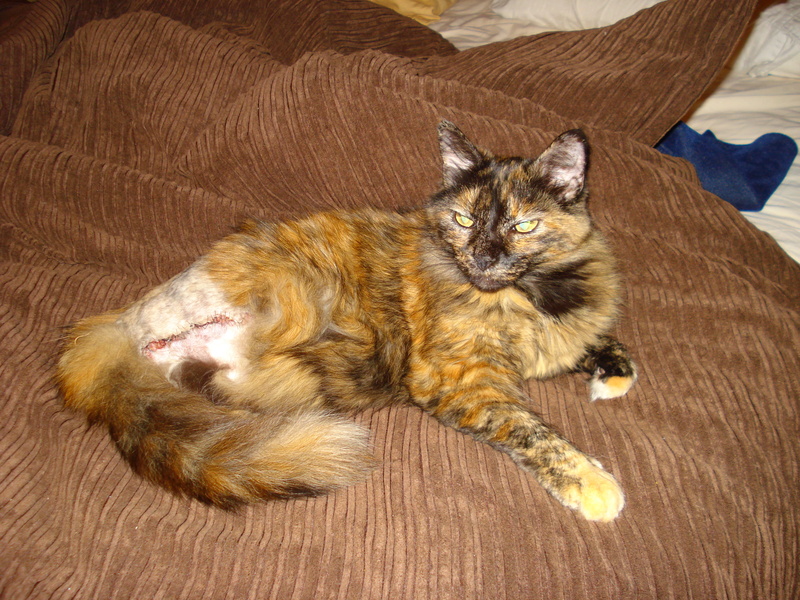 Wailea passed away 15 months later after thousands of dollars of additional care. Wailea’s death helped inspire Dr. Roman’s charitable DrDoMore and DrShowMore Projects. I (Jan Rasmusen, this blog’s author) have my own vaccine to tell. My precious year-old Jiggy developed autoimmune liver disease shortly after rabies vaccination and redundant “puppy shots.” Now age 12, Jiggy is fighting both liver and bladder cancers. Veterinarians link his autoimmune disease to vaccination – a known reaction according to AAHA Guidelines. For 11 years, Jiggy has received quarterly blood draws and vet checks plus six ultrasounds, countless consultations, a CT scan, 2 biopsies, a $7000 cancer surgery and every treatment imaginable. Jiggy’s illness was the inspiration for all my research and my book. Many of the vaccines given these beloved pets could have been avoided by a simple blood test or increased information before vaccination. Their stories are just the tip of the iceberg. Read more about vaccine reactions, and find evidence-based vaccination information from experts, at our new not-for-profit website, Truth4Pets.org. Join us, and join countless concerned veterinarians all over the country, in our quest to improve client and veterinary education to end this tragic hidden epidemic. Don’t forget to sign our petition: Veterinarians: Fully Inform Us Before Vaccinating Our Dogs and Cats And spread the word! Vaccine Reactions — What conditions are recognized reactions? My Maltese died at 4 years old from GME. I suspect it was triggered by a rabies vaccination administered in her neck, which produced a lump at the injection site. I will sign the petition. SJ, I’m so sorry. Sadly, I hear stories like yours all too often. Thanks so much for signing the petition. And please tell everyone you know. We have to make vets understand the damage they are doing. If you’d like to tell your story, please let us know. Hello.. there is so much to read and understand about what to do and what not to do. This confusion makes me ponder not getting another pup.. but the truth is I love pups to much for that to not occur. My question is simple, do I or should I get any vaccine for my next pup? Do I really even need a rabie shot? Re rabies: it is required by law. My Keegan, a 7lb rescue Pom who was so healthy and loving, died suddenly 3 days after receiving DAPP, Leptospirosis, Bordetella and Lyme in a single visit. I so wish I had seen this site before the vaccinations were given. The vet did not recommend holding off on any vaccines or seperating into future visits. I am so devasted by this loss because it appears it could clearly have been prevented. Ann, I’m so sorry about Keegan. Please join our campaign against these tragedies. Please send us your story and a photo of Keegan to post at http://www.truth4pets.org/tell-your-story. Let Keegan’s death help bring about change. I wish I could do more for you. I lost my Jiggy last month to a vaccine-induced disease. Carlene, what a story! You are calling the infection mercy. Do you mean maybe MRSA (pronouncer mersa). It’s a very difficult to treat antibiotic resistant bacteria. Very dangerous. Dangerous to you as well. Has your vet reported this to the health department. If it’s MRSA, you must report it. Demand they get to the source. If it came from the clinic, they should pay all your vet bills and then some. Have you reported this to the drug maker? Regarding vaccinating again — I would move heaven and earth not to. In our index you’ll find an article about eliminating unnecessary shots and getting an exemption for rabies vaccination. 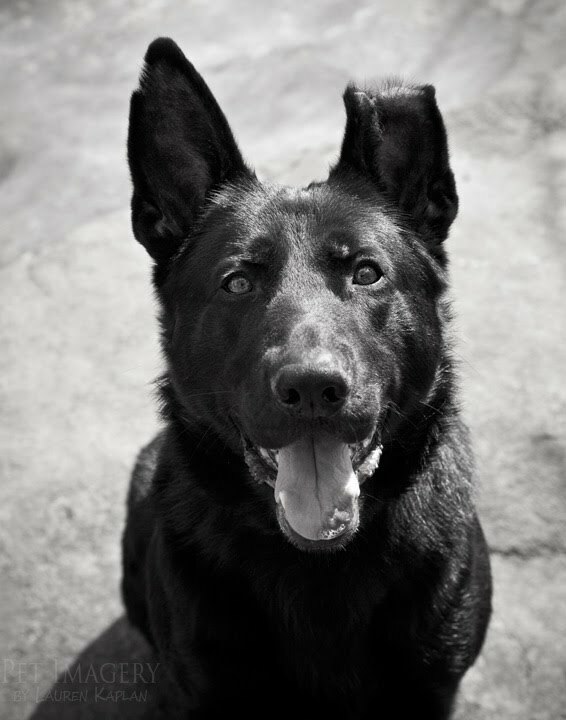 http://www.dogs4dogs.com/blog/index-2/ Let me know what else you need help with to get an exemption. Above all make sure you get a copy of your dog’s file. You’re going to need it. I just found out today that my 8 yr old cat is in liver failure. She stopped eating right after getting her annual vaccinations, but the vet says it isn’t related. I find it very hard to believe this because my cat was healthy before the shots and she also had a check up and the vet said she was in perfect health. How else, if not the vaccinations, could this liver failure have happened so suddenly? I’m looking at possibly putting down a member of my family because I may not be able to scrap up the hundreds of dollars for the liver failure treatment. I have failed my pet. She doesn’t deserve to die like this. Of course the reaction can be caused by vaccination but vets prefer not to admit it. I’m so sorry for your predicament. Know, however, that if the same vet that gave the shots is the one saying your cat’s condition is hopeless, you should get another opinion. Your vet may not know how to treat your cat. My daughter was having symptoms of Autism, and they worsened noticably after every shot. Finally I caught on and decided “this is the last one!” but it was too late. Shortly after we switched doctors and she was immediatly tested and diagnosed with Autism. If I could, I wouldn’t vaccinate my animals at all, I would stop completely like I did with my children. But it’s the law that they get certain ones. Does anyone have a list of vaccines that the dogs should get, so I can stop all the others? Reading these stories is so upsetting! My 5-year-old cat got his three-year rabies and annual distemper booster a little over a month ago. He stopped eating a week ago and has been very lethargic. I took him to the vet and she found nothing outwardly wrong with him, then did blood work. I will not know the results until tomorrow. I immediately questioned if this was due to the vaccines, but she denied this, saying that he would have had a reaction a lot sooner, and not a month later. Meanwhile, he started having periodic seizures when he was 2. I am wondering if there is a correlation between this and the vaccines. I certainly will stop this nonsense. I just pray that he survives this. Abby, vets don’t ever want to believe that vaccines cause health problems. Reactions can happen immediately or six weeks or more later. Cancer can develop much later than that. One more thing: not all states require rabies vaccination for cats. Check and see if yours does. Vets don’t always know. Mary, look into homeopathy for treatment. 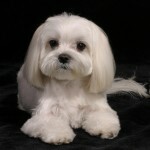 Check out the referral lists at http://www.truth4pets.org/vets Good luck. I signed this petition for my cat “Sweetie” who died within 48 hours of vaccines. She also became very tempermental with her sister. I feel the shots they give them every year has done this to her She has to take diaziapam twice a day, an antibiotic and Itopia. This should not be allowed. Fran, it sounds like your vet gave way to many vaccines at once and it has thrown off your dog’s immune system. Find out exactly what shots the dog got. Report the reaction to the manufacturer of the drug. Ask for help. Fire your vet. 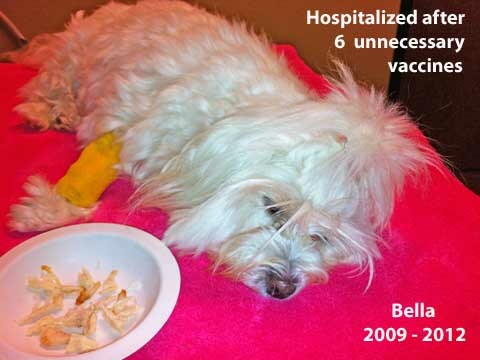 What kind of vet tranquilizes a dog instead of treating the vaccine reaction? What kind of vet vaccinates every year when no veterinary organization recommends it? What kind of vet even considers killing a dog just because they don’t know how to treat her? In my book, only an incompetent, greedy vet would do this. What do you think? Fran, I just noticed that you said your dog was getting antibiotics and “Itopia.” Why would the vet give her antibiotics? And what is Itopia? I lost by 8 yo wire fox terrier about 13 weeks after he had received Bordetella and leptospirosis vaccine. I had asked for the Bordetella as we were possibly having to board him. He was given the Lepto without my knowledge. 5 weeks after the vaccines, he was diagnosed with immune mediated thrombocytopenia. After high dose Prednizone, Azothiaprine and a short course of Atopica which caused him to completely lose his appetite/GI upset/diarrhea he continued to go down hill. 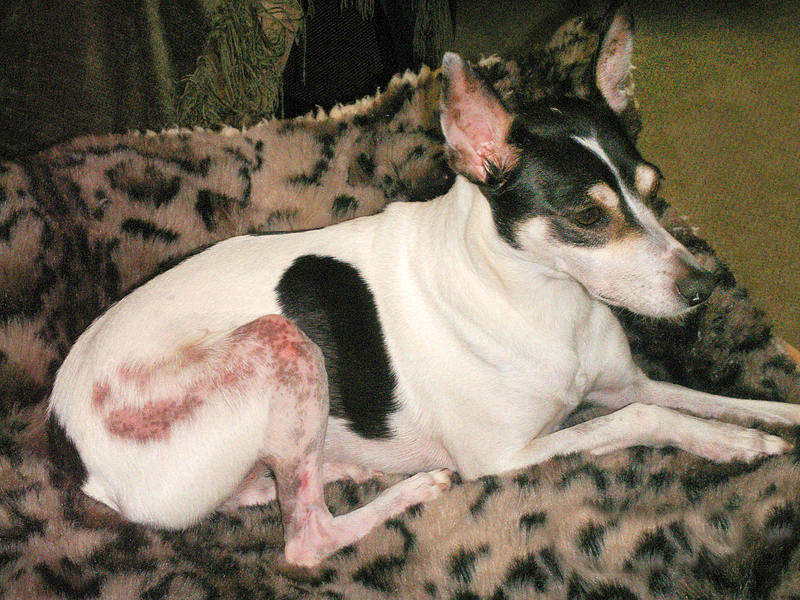 He then developed an abscess on an inner leg and platelet count had gone down after all that he had been through. After the horrible ordeal he went through, with probably at least another 4-6 years left in a perfectly healthy dog that had absolutely no other medical problems. Also, the heart ache to all of us and a nice $2500 bill. At the time of the vaccines, he told my husband, “Fenster’s in great shape!” I am taking this as far as I can go as he DID NOT FOLLOW the AAHA Canine Vaccine Guidelines. I will tell EVERYONE I know. I wish I had known about the dangers of canine vaccines…I am a woman on a Mission! I found a new vet very up to date on all factions of medicine for our pets..when we first met he said, we do not have to give our great danes shots but every 3 years..I was taken a back at first till he explained we are killing our loved ones by over innoculating them every year…do your homework and find the truth..
Howard, you wrote about your vet: “when we first met he said, we do not have to give our great danes shots but every 3 years.” That makes him a cut above a lot of vets, but still a bit behind the times. The American Animal Hospital Association is the organization that started the every-three-years idea, but the AAHA report actually said NO MORE OFTEN than every three years. Do you get your own childhood shots every three years? Why would you? Why should your dog? Please read this: http://truth4pets.org/question-before-vaccination/ It will tell you what you need to know and offer links to supporting studies. Also check out the videos on the website, particular the set of 4 in which Dr. Becker interviews Dr. Schultz. My cat was being treated for thyroid disease when her rabies shot was due, the vet gave it to her and the next day my cat was dead.The day before the shot she was doing well, then after the shot she got real weak, stopped eating and drinking. She went down hill at a record pace….It was awful to see her go like that. Never trust a vet again………. Most states don’t require rabies vaccination for cats. Are you sure yours does? I had 10 beautiful registered 6 week old blue championship bloodline (energetic, playful) puppies, three days ago I gave them their recommended vaccinations (canine spectra 6) within hours they became deathly ill, stopped eating and drinking, they started having white severe diarrhea, and vommiting , I’ve been pushing fluids through a syringe, today, they can’t move or even swallow,, they are foaming out of the mouth, I started them on iv fluids, praying for a miracle…..
All vaccination is over vaccination. 35 years of research has convinced me that vaccines are nothing but pure POISON. There are ways to keep yourself, your children, and your animals healthy, and none of them include injecting POISON. Read Natural Immunity by Pat McKay. It is available to read free online. Rabies is a vaccination one cannot ignore. Small animals can get into the house and be caught and eaten by cats and even dogs. Once pets begin to show symptoms, animal owners might be exposed to the disease and for all intents and purposes it is fatal. This vaccination is a necessary evil. Feline leukemia also is a vaccination cat owners should consider. Then that’s it. Vets will often over-vaccinate just to put money in their pockets and some animals and even people will die from vaccinations. Consider, too, getting a water distiller from Amazon for about $70 and giving your animals unfluoridated water with no other additives. For those animals with liver problems, buy milk thistle and B12 from Amazon and combine them. Then give your pet between 8 and 20 drops depending on their weight. We kept our cat alive for well over a year after we got his death warrant from our vet. Watch the dosage, though. We lost our 3.5 yr old dog to IMHA Christmas day (2018) She got her yearly booster Nov 22 and Dec 22 she became lethargic, thirsty, would not eat and had blood in her urine. We rushed her to the OVC, had 3 blood transfusions, numerous drugs. Nothing worked. Seeing her laying in ICU was heart wrenching. I knew nothing about IMHA before hand and had never heard of a titer test. I feel so guilty, she was only 3.5 for gods sake. Please, every one here keep pushing for change. John, very few, if any, small animals carry rabies. Really, it’s only bats. And very few are rabid. Check your state stats to see when the last rabid animal was discovered.